Nouveau Plan de Paris Divise en 20 Arrondissements Dans un rayon de 10 kilometres. 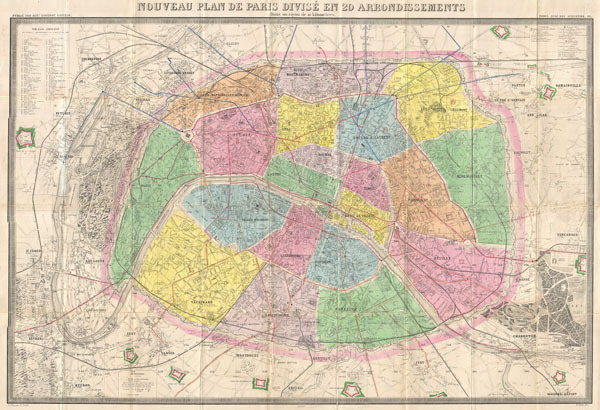 An extremely large 1878 pocket of Paris by A. Logerot. Covers the walled center of Paris as well as its immediate vicinity, including the Bois de Boulogne and Bois de Vincennes. All streets and many important buildings are noted throughout. Color coded by arrondissement. All text in French. This map was first issued by Logerot in 1859 and updated annually through the 1880s. This is the 1878 edition drawn by Ch. Smith. It was originally purchased by A. H. Green from F. W. Christern, a stationer and bookseller established at University Place, New York. A. H. Green, whose signature appears inside the front panel of the original binder, acquired this map in preparation for his European Tour. Though most maps are without substantial provenance, this map is known to have been originally purchased for the European tour of the prominent 19th century New Yorker Andrew Haswell Green (1820 - November 13, 1903). A. H. Green was a New York lawyer, city planner, civic leader and agitator for reform. Called by some historians a hundred years later 'the 19th century Robert Moses,' he held several offices and played important roles in many New York projects, including the development of Riverside Drive, Morningside Park, Fort Washington Park, and Central Park. His last great project was the consolidation of the 'Imperial City' or 'City of Greater New York' from the earlier cities of New York, Brooklyn and Long Island City, and still largely rural parts of Westchester, Richmond and Queens Counties. In 1903 Green was murdered in a case of mistaken identity. He is buried in Worcester. In 1905 his family estate in Worchester was turned into a public park. Green's personal effects and other belongings were stored for over 100 years until recently being rediscovered and offed for sale. Auguste Logerot (fl. c. 1839 - c. 1880) was a French map and general interest publisher active throughout the mid to late 19th century. A. Logerot worked with other French publishers, cartographers and engravers of the period including Fremin, Dufour, Dyonnet, and Vuillemin. He published a large corpus of map and geographical atlases, though few of his map represented unique or exceptionally interesting work. This exception are his wonderful jigsaw puzzle maps - a style popular in 19th century France. Jigsaw puzzle maps are a kind of educational map printed on board and carved up in puzzle format. Logerot's imprint is frequently misprinted as Lagerot or Logeret. Logerot shared offices with several other publishers, printers and engravers at Quai des Augustins 55, Paris. Little else is known of Logerot's life and work. Good condition. Original folds exhibit some wear and verso repairs. Small repair bottom center near Observatoire. Comes with original red linen binder. Vallee, Leon, Catalogue des plans de Paris et des cartes de l'ile de France, Bibliotheque Nacionale, 1941 (Ge FF 10880).